Today is my 31st birthday. Though I started celebrating a little early, (over the weekend) today is my official birthday. In honor of the day, I've decided to list some of my favorite birthday gifts I've received along with the year I've received them...if I remember. Reminisce with me on the differences between my 13th birthday and my 31st birthday here. Boombox/stereo set - I think I was about 11. It looked kind of like this without the extra speakers on top. I was in love! Set of rainbow glitter nail polishes and body glitter - back when facial glitter was all the rage. 90s kids you know what I'm talking about! Shot of Patron Silver - This was for my 21st birthday. This introduced me right away to top shelf liquor. For this I am thankful. Dalmation mini backpack - I think I was 13? You know those animal mini backpacks that were all the rage in the 90s. Yep, I had a Dalmatian dog one. Limited Too sweatshirt - I didn't have a lot of expensive clothes growing up, though a lot of my friends did. For my 7th birthday, I got a Limited Too sweatshirt and you'd have thought I'd died and gone to heaven. And now, also in honor of my birthday, I will share with you some great Birthday GIFs. :) Because it's not a real party until someone busts out GIFs, right? 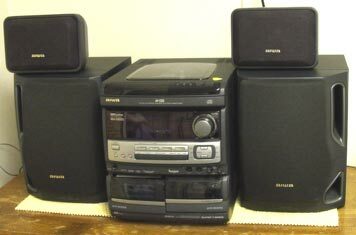 I had a very similar boom box that I loved. Also, that first gif is what plays in my head every time I think about anyone's birthday.